‘Where is New Amsterdam then?’ I hear you think. Alas, New Amsterdam no longer exists. Nowadays you might know this place better by the name of New York City. Not everybody knows this, but the Dutch ruled the area for over 40 years till they lost it to the English in the 17th century. Just imagine that this hadn’t happened: glorious Dutch with its characteristic guttural sounds could have been the dominant world language! 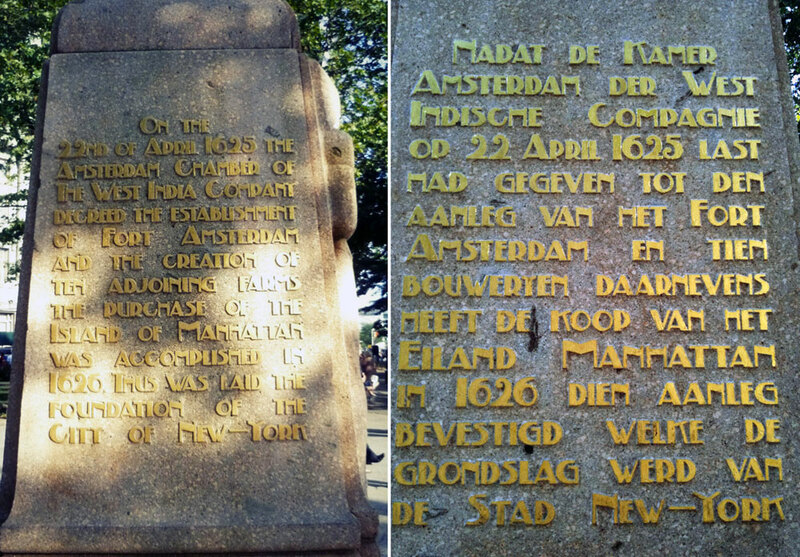 Although the Dutch reign over New York is a thing from the far past, this part of history is still overtly present in the city’s street names and even in the country’s language, traditions and identity. This post is a short exploration of Dutch New York guided by some pictures I took during my trips to NYC and the interesting book Exploring Historic Dutch New York. No Sleep Till Brooklyn Breuckelen! Behold the famous Brooklyn Bridge! Did you know that Brooklyn is named after the early Dutch settlement Breuckelen? The following well-known New York City street names and areas were also originally Dutch. Cortlandt Street and Gansevoort Street in the photos below were named after 18th- and 19th-century descendants. Nassau Street below was named after the Dutch prince and Stadtholder William of Nassau (1650-1702), who became King William III of England. Van Wyck Expressway takes its name after 19th-century descendant Robert Anderson Van Wyck (1849-1918), the first mayor of New York City. Did you know that the surnames of the following famous American icons date back to their 17th-century Dutch ancestors: Jane Fonda, Humphrey Bogart and Bruce Springsteen? The name Springsteen literally translates to ‘jump’ (spring) ‘stone’ (steen), but in this context it denotes the home of the Springsteens in the Low Countries after which they took their surname: a large rock or stone from which a spring flowed. And what about the surnames of these powerful families: Vanderbilt, Stuyvestant and even Roosevelt? Yes, all these families have Dutch ancestors! The first European explorers to reach New York were the French. They discovered New York in 1524 and started to trade goods with the Native Americans, but never claimed any of the land. In 1609 English sea commander Henry Hudson (after whom the Hudson river takes its name), employed by the Dutch East India Company, reached the North America shore on his ship Halve Maen (Half Moon). After Hudson’s return and report on his explorations, Dutch merchant companies set sail for North America and started a profitable fur trade with the Native Americans. It wasn’t till 1624 that the first colonists arrived at New Netherland in order to secure the land from the English who were eager to take over all commercial activities. In 1626 the Dutch established their first settlement at the southern tip of Manhattan Island, or Manna Hatta (‘hilly island’) as the Native Americans called it, and traded the entire island for goods worth the outrageous amount of a mere 60 guilders. In the pictures below you see the Peter Minuit memorial in Battery Park, in the south of Manhattan Island. Peter Minuit was the director of New Netherland at the time of the purchase. New Netherland comprised (parts of) New York, New Jersey, Pennsylvania, Connecticut and Delaware. You can find more Dutch connections to New York City in Battery Park such as the New Amsterdam Plein & Pavilion (inspired by tulip petals and windmill sails) at Peter Minuit Plaza. The pavilion was a gift from the Kingdom of the Netherlands in 2009 to celebrate Henry Hudson’s landing 400 years before. A stone path around the pavilion tells you the story of the first Dutch settlement. I had my little helpers copy all these texts for you. You can download the PDF here. I grew up believing this story, but it proves to be an urban legend. Surinam is a country in South America (and happens to be my mother’s and brother’s birth country). Surinam was indeed a Dutch colony from the 17th century and belonged to the Kingdom of Netherlands from 1954 till 1975, but it was never traded for another piece of land. The Dutch Republic took Surinam from the English during the Second Anglo-Dutch war (1665-1667) which started after English troops managed to seize control over the thinly populated New Netherland. During the Third Anglo-Dutch war (1672-1674) the Dutch reclaimed New York and renamed it New Orange, but had to give up on the land in 1674. This was the end of New Netherland. The influence of the Dutch doesn’t stop with street names. Even some of the food we consider as authentic American now have Dutch roots. You think the doughnut is a typical American invention? Think again. It was brought to North America by the Dutch in the 17th century as oliekoeck (oil cookie). in the next centuries the recipe evolved and from the 19th century it looked like we know it today; a nice sticky round cake with a hole in the middle. And did you think that the words cookie and cole slaw were original English words? Wrong again! Cookie derives from the 17th-century word koeckjen, which, as explained in the book Exploring Historic Dutch New York, ‘in some Dutch dialects might have been pronounced “koekie”, sounding like the American word’. Cole slaw comes from the Dutch word koolsla, which literally means cabbage salad. Also pancakes and waffles were brought to North America by the Dutch. Dutch Girl with a oliekoeck. Nothing typical American seems to be sacred in this article, not even the origins of that jolly old man Santa Claus! In the Netherlands we know this man by the name of Sinterklaas or Sint Nicolaas. Say these names out loud. Sounds familiar? In the Netherlands we still celebrate Sinterklaas on the 5th of December. Sinterklaas doesn’t come from the North Pole, but was actually a saint from Turkey. Instead of elves he can count on the help from his friends Zwarte Pieten (‘Black Petes’). Read my previous post ‘Sinterklaas: about a saint and a castrated rooster’ to learn more about this curious Dutch tradition. Although popular belief is that Coca-Cola re-invented Santa Claus for marketing purposes, they were actually not the first soft drink company to use images of Santa. However, it is true that Coca-Cola has played a significant role in shaping the image of Santa Claus. Have you seenTim Burton’s film Sleepy Hollow? This was loosely based on the short story ‘The Legend of Sleepy Hollow’ (1820) by American author Washington Irving. You might remember the Dutch-sounding names and mills in the film. Like in Irving’s story, the characters in the film are descendants of 17th-century Dutch settlers. The church which plays a prominent part in the film actually exists. The Sleepy Hollow Church, also called the Old Dutch Church, was built in 1685. Also the protagonist of Washington Irvin’s short story ‘Rip Van Winkle’ (1819) is of Dutch descendant. In fact, Irving himself had Dutch blood running through his veins: his mother was Dutch! He was fluent in a number of languages, including Dutch. In 1835 Irving and more prominent New York citizens organised the Saint Nicholas Society to preserve knowledge of Dutch-American history and culture. 180 years later, this society is still active! You can visit their website here. I’m not quite sure how this claim stands in the current political climate, but traditionally the Dutch have been tolerant people. During the Golden Age it was fairly easy to immigrate to the Low Countries and in some Dutch cities the first social melting pots flourished. According to the book Exploring Historic Dutch New York the Dutch brought their sense of tolerance and free-trade with them to New Netherland, sewing the seeds for modern-day New York: ‘New Amsterdam’s melting pot society (18 languages were being spoken in its few streets) turned into the multiethnic mix of New York’. When great waves of immigrants arrived in Manhattan in the 19th century, they spread out over the country and took these two principles with them. ‘If, therefore, you could travel back in time and visit New Netherland, you would find yourself in proto-America: the country’s first free-trading, immigrant society’. If you look closely, you can still find quite some buildings in New York City and upstate New York that reveal the previous Dutch presence. Unfortunately, the windmill that once stood in southern Manhattan has disappeared now. Crow-stepped gable roof, photo taken from an apartment near Central Park. Let’s finish this post with some sayings that are not favourable towards the Dutch, to say the least. The following sayings reflect how the English, and later Americans, thought of the Dutch. To go Dutch / Dutch party / Dutch dinner: every person pays for their own meal/share when going out. Interestingly, in the Netherlands we say Americans feestje (‘American party’) to denote a party where every guest brings along some food or drinks. If you want to know more about this fascinating period in Dutch-American history, then I highly recommend the book Exploring Historic Dutch New York (ed. Gajus Scheltema and Heleen Westerhuijs) which I used as my main source for this post. On the website you can explore New Netherland on maps. Posted in culture and tagged Bruce Springsteen, Dutch courage, Dutch history, Dutch oven, etymology, Gajus Scheltema, Heleen Westerhuijs, melting pot, Netherlands, New Amsterdam, New Netherland, New York, Saint Nicholas Society, Santa Claus, Sleepy Hollow, Washington Irving. Bookmark the permalink. What a great post! I knew some of these things, but most of them I had no idea… Thanks for the history lesson. Loved it. Now I will be looking at New York differently next time I’m there! Thanks so much for your kind words 🙂 Glad you liked it! I really enjoyed this one! Although I was familiar with most of it, there were some things that were new to me. Double dutch can also mean a form of rope skipping, and is a form of contraceptive, namely the use of double protection. And remember the line of this song: “Pass the dutchie (on the left hand side)”? A reggae song by Musical Youth in 1982 (but I am a little bit older?) about sharing a reefer/joint together. Hi Esther, thanks for your feedback! Yeah, I think us Dutchies do know this bit of American history, but surprisingly not many British people (or from other countries) know this! I didn’t know the one about the double protection though so thanks for sharing that one here!